Of course, “Californians for Life”, as women ourselves and as parents, friends, spouses, neighbors and loved ones, we care about the health of every mother, every woman. Under these conditions, there are very difficult decisions and the emotions can be overwhelming. Yet, when making the irreversible decision to end the life of child in the womb, we would hope that every effort would be made to preserve and protect the health and life of both mother and baby. We recognize the severity of these circumstances and would encourage second opinions and thorough research before making such a life-changing and life-ending decision. Fortunately, these cases are extremely rare, and due to amazing advances in medical technology, are becoming more and more treatable, saving the lives of both mother and baby. Here is a beautifully supportive organization for women who are pregnant and diagnosed with cancer, Hope for Two, which provides the very latest information about cancer treatments that can be used safely during pregnancy. Here is a list of American Association of Pro-Life Obstetricians and Gynecologists in California. When the life of the mother is truly threatened by her pregnancy, if both lives cannot simultaneously be saved, then saving the mother’s life must be the primary aim. If through our careful treatment of the mother’s illness the pre-born patient inadvertently dies or is injured, this is tragic and, if unintentional, is not unethical and is consistent with the pro-life ethic. But the intentional killing of an unborn baby by abortion is never necessary. This information is from Students for Life.org Please see their website and AbortionFacts for additional information. There are certainly cases where the mother’s health may be put at risk by pregnancy, such as in an ectopic pregnancy. However, actual life-threatening issues involving pregnancy are vastly different than generic “health” issues. If any doctor tells you that a pregnancy is a risk to you and recommends an abortion, seek a second opinion. Keep in mind that some doctors fear the malpractice lawsuits associated with treating high-risk pregnancies, and are unwilling to take patients with complicated pregnancies. Fortunately, there are many doctors that specialize in high-risk pregnancies that can successfully treat both the mother and the unborn child as patients. 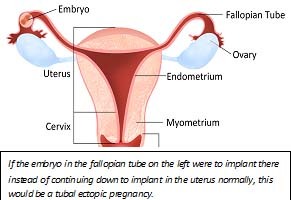 Ectopic pregnancy refers to any pregnancy that is implanted outside the uterus, most commonly in the fallopian tube. By the time an ectopic pregnancy has been discovered (usually by 7 to 8 weeks gestation) the embryo has died in the majority of cases. However, the supporting tissues for the pregnancy often continue to grow and can cause life-threatening bleeding, either through rupture of the fallopian tube or other mechanisms. In a small number of cases a living embryo can be observed in the ectopic pregnancy. Unfortunately, this embryo will die in the near future if observation is continued, and the mother’s life remains in imminent danger from a life-threatening hemorrhage, before and after the death of the embryo. Continuation of such a pregnancy cannot result in the survival of a baby and entails a very substantial risk of maternal death or disability. Hence treatment is commenced to end the pregnancy surgically or medically. In certain cases, an additional benefit of early treatment may be preservation of fertility potential. This scenario is somewhat analogous to the case of a woman who develops an intrauterine infection with an unborn child that is too early to survive outside the womb. There is no chance for survival of the child, either inside or outside the womb, but there is a very real, imminent danger of death or disability for the mother. In these cases delivery is effected to preserve the life of the mother. Regrettably, in each of these clinical situations the child cannot be saved. In either case, the intent for the pro-life physician is not to kill the unborn child, but to preserve the life of the mother in a situation where the life of the child cannot be saved by current medical technology. For these reasons the American Association of Pro-Life Obstetricians recognizes the unavoidable loss of human life that occurs in an ectopic pregnancy, but does not consider treatment of ectopic pregnancy by standard surgical or medical procedures to be the moral equivalent of elective abortion, or to be the wrongful taking of human life. For Catholics, here is a more thorough discussion on the Church’s teachings regarding abortion and ectopic pregnancies.